The Bladder Tank is an integral component of the bladder tank proportioning system, which requires no external power other than an adequate water supply. 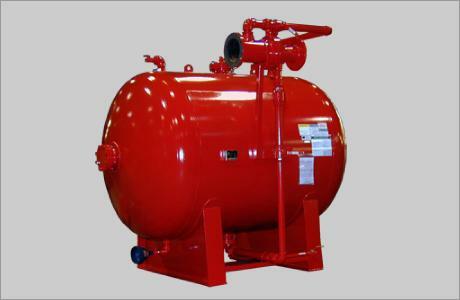 A bladder tank, with an appropriate proportioner(s), injects foam concentrate into the water supply of a fire protection system and automatically proportions over a wide range of flows and pressures. The National Foam bladder tank is a steel pressure vessel fitted with an internal bladder that stores foam concentrate. During operation, water supplied to the bladder tank displaces the foam concentrate and collapses the bladder until the concentrate is depleted. The bladder tank discharges foam concentrate at approximately the same pressure as the water supplied at the water inlet connection to the tank. Since the bladder tank is pressurized, the bladder should not be refilled during operation. Frequently used in aircraft hangars, loading racks, sprinkler systems, and offshore platforms.